We scrounged together $1000 to send out our brochure to the top advertising and marketing firms in Chicago. Several took the bait. Essentially, I was giving them an Internet and email lesson and trying to convince them to get their clients on the web, with our assistance, of course. It was a tough sell, but we were patient. 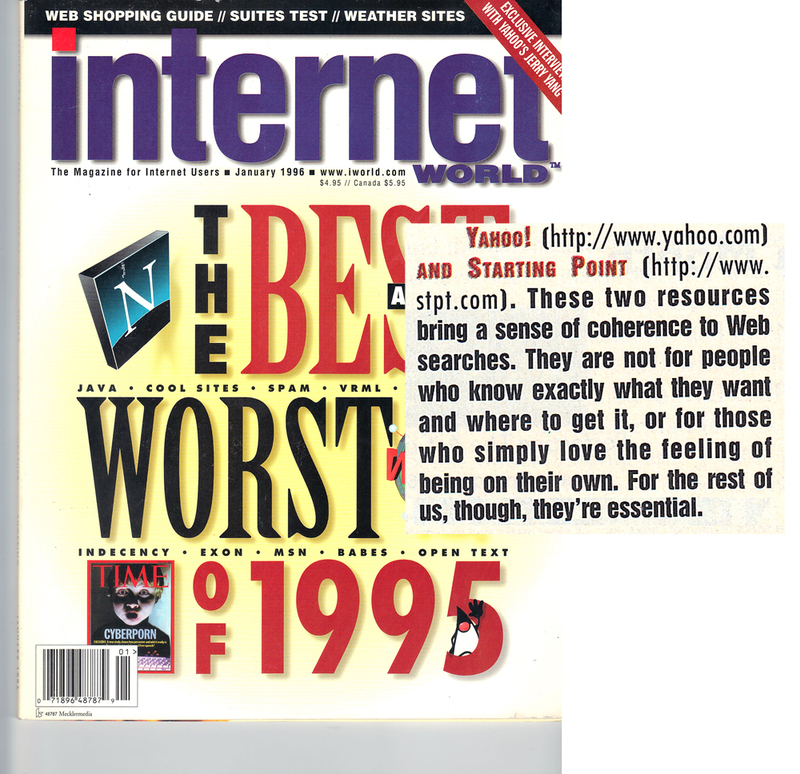 By the summer of 1995, I was speaking at events as the Internet “expert” even though I had just figured this thing out a few months earlier. I guess I was the closest thing to an “expert” as there was at the time. Business trickled in. After 6 months, I moved our world headquarters out of my dining room and into a single shared office space. 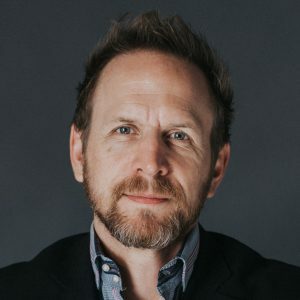 We had gained enough momentum to convince our partner, Keith, to jump in full-time. There may have been a little strong-arming involved. We did a few key things early on that many established companies I work with today neglect to do. We got a good accountant and a great lawyer (Bart Loethen with SynergyLawGroup.com) who grew with us from start to finish. We created (and signed) a buy-sell agreement for the partners. We got key-man life insurance that we, fortunately, never had to use. We established banking relationships and lines of credit before we needed them. We did everything by-the-book even before it seemed like it was real because we believed that we were creating something significant. We were committed, and we wrote that commitment into our Buy-Sell Agreement. We agreed that all of the partners would be required to join the company full-time by June 1, 1996, or be subject to clear buy-out provisions. Ken joined full-time in January 1996 and John followed shortly after in March. There was a hold-out, however, who will remain nameless, who decided that he didn’t want to quit his other full-time job or be subject to the buy-sell provisions. He tried to hold some key software “hostage” and forced us to serve him orders from the sheriff on Monday morning at his office. It’s just a reality of business and, unfortunately, wasn’t the only time we had to enforce the buy-sell. The first year, we had been meeting weekly at Ken’s apartment. We were in awe at the power and efficiency of email and how effectively (we thought) we could run the business remotely. I had the small office downtown Chicago, Ken was in the northern suburbs, and Keith and John were both in southern Wisconsin. I was convinced that we all needed to be in the same place if we were going to really grow this company. We signed the lease for our first real office in the fall of 1996, in Libertyville. Since Ken lived in the middle of us all, the office went near him. The rest of us had 1.5 hr commutes for the next 4 years. I wasn’t going to give up living downtown and move to the burbs in my 20s. Employees and many business owners today seem to be enamored by the concept of working remotely. I’m not buying it, especially for a younger company. Remote employees must have a completely task-oriented job and be extremely self-motivated to pull this off. Plus, the remote employee will never truly feel fully connected to the company, its culture, or its goals. While this may work for established IT departments, solo-preneurs, and outside sales, it should be avoided, in my opinion, for companies less than 5 years old. Back off the soapbox and to my story. It was late 1996/early 1997 and all 4 partners were together full-time in our office. We were finally able to clearly define our roles and drive the company forward. We were hiring people in sales, operations, software development, and it felt great to be shedding the multiple hats of entrepreneurship. We were poised for growth. It’s an important experience for an entrepreneur to have worn the many hats of their company at some point and be knowledgeable about what your employees do. You never know when you may have to throw it back on in a crunch. But, don’t deceive yourself into thinking you can do it all. You shouldn’t even try. In almost every case, someone else can do it better. It’s humbling personally, but very rewarding as a business owner. In our first year we were primarily building websites for companies. We came to the realization early on that a website wasn’t just an advertisement meant to drive traffic to some offline entity. A website had to be the destination and had to be promoted online. We decided to become WebPromote and focus on products and services to promote websites online. We phased out website building and, thankfully, Superhighway Consulting. Building websites just wasn’t scalable enough and everybody was doing it. Before I get too far into WebPromote, let me tell you more about Starting Point and our missed opportunity. 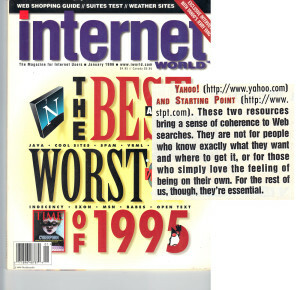 In early 1996, Internet World magazine picked “The Best and Worst Websites of 1995.” This was the quote: “Yahoo! (http://www.yahoo.com) and Starting Point (http://www.stpt.com). These two resources bring a sense of coherence to Web searches. They are not for people who know exactly what they want and where to get it, or for those who simply love the feeling of being on their own. For the rest of us, though, they’re essential.” We pretty much fell out of our chair when we saw this. To even be mentioned in the same breath as Yahoo! was amazing. Based on this, you would probably guess this was our $700M exit. Nope. While Yahoo! was located in Silicon Valley and raising $3M, we were in the Midwest, which was not the mecca for Internet startups in the 90s. We had little awareness of the world of raising capital or even the potential of what we had. We hadn’t perceived yet what the end game for Starting Point could be. Over the next year other directories kept coming out and raising money: Excite, Lycos, Altavista, Infoseek, etc., while we stagnated. We attempted to spin off Starting Point as a separate company with a marketing partner, but we’d already missed the window of opportunity. We learned a few lessons that would be important a few years later. 1. Know what game you’re playing and the rules. 2. Focus. 3. Create an Exit Plan.